For those of you hungry for original magic, with just a pinch of INSANITY, dinner is now served! Start by displaying both sides of your credit card, then go crazy - literally BITE THE CORNER OFF your credit card! Show'em the bite mark and chew a bit, you don't wanna choke yourself... But plastic tastes awful, doesn't it? It's bad for your health too, and we cannot be held responsible, so aim from a distance and SPIT IT BACK onto the card. In a blink of an eye the card will be FLAWLESSLY RESTORED to mint condition. Now hand them the card to verify it's as good as new. 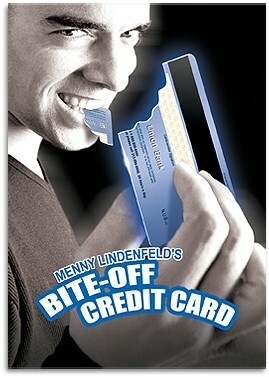 Bite-Off Credit Card is not just an effect, it's the top of the food chain! Examinable before and after performance.